The Nine Elms Vauxhall Partnership, as a Tate Exchange Associate, has launched a new arts engagement project which will bring clay and digital storytelling workshops t o a network of galleries on the south bank of the Thames. 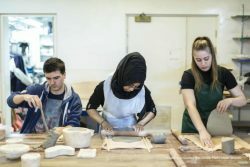 The project – called Material Action – will offer young people from Wandsworth and Lambeth the opportunity to explore clay working and exchange their experiences of the developing area with the support of skilled and established artists. The workshop programme will be run by arts group Collective Matter, and will take place in Beaconsfield Gallery Vauxhall (BGV), Gasworks and Pump House Gallery – three key venues within Nine Elms on the South Bank’s fast growing cultural network. The project is part of the Tate Exchange programme and will culminate in an interactive and participatory workshop to showcase the young people’s work within Tate Exchange at Tate Modern, one of the world’s most prestigious arts venues. Young people taking part will have the opportunity to collaboratively express their observations and memories of the local area, through creative clay making. The workshops aim to encourage participants to create works which reflect on the changes taking place across Nine Elms and Vauxhall. The workshops will take place between January and March 2017 at Beaconsfield Gallery Vauxhall (BGV), Gasworks and Pump House Gallery and the participatory event at Tate Modern will be held on March 10th. The first creative clay workshop, which is open to anyone to attend, will take place at Gasworks (155 Vauxhall St, London SE11 5RH) this Sunday 11th December 2-5pm. Participants are invited to drop-in and contribute to an evolving clay ‘building site’. “This project combines the exceptional creative talents of three superb galleries and draws on the inspiration of Tate Modern. It will result in a unique, rich and interesting creative experience for young people in Wandsworth and Lambeth and is a great example of this area’s regeneration programme opening up new opportunities for our local communities. Vauxhall was once home to the renowned Royal Doulton pottery company and clay brick is a key building material across the regeneration area. Battersea Power Station, which sits at the western end of Nine Elms, is reportedly Europe’s biggest brick building. This unique public-private partnership has a shared vision for the area and is driving forward its ambitious place-making and cultural development programme in close consultation with local communities.